CBSE 10th Result 2019: The Central Board of Secondary Education (CBSE) started the exams as early than ever this year. Also, the board decided to declare the results early than usual. 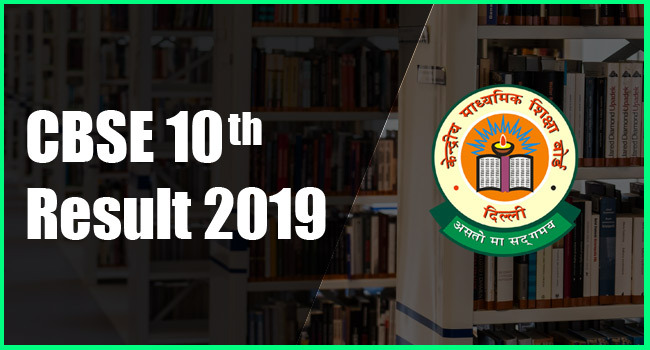 The expected date of CBSE 10th result 2019 is around between the first and second week of May 2019. A senior official at the CBSE regional office in Dehradun said, “The board has decided to complete evaluation of all examination papers by April 20 and declare results by May 10.” But there is no official notification yet regarding the declaration of results for both class 10 and 12. Usually, the results of both classes are announced in the third or fourth week of May. In the notification issued by the board in early February stating that the CBSE class 10 and class 12 results would be declared early this year. So, the students can check their results on the date which will be confirmed by the officials shortly after the completion of the paper evaluation. We are here to help, so students can check their results instantly from this page to the official result page. We will update the live links of the CBSE 10th result 2019 page when it will be available online. So, we request the students to bookmark this page to check the CBSE Class 10 result 2019 instantly on or after the result declaration without wasting time. Check updates from this page if any notifications and news released by the board about results. As mentioned early, the Central Board of Secondary Education (CBSE) is ready to announce the result as early as possible in May. The board has launched a new mobile application on 18th March, it named as CBSE Shiksha Vani. The main purpose of this app is about to circulate the important information to students and parents of class 10 and 12 through the podcast. The CBSE Board Examination 2019 evaluation process has already started, according to the official circular by the board. So, students can expect the result on or before May 10th, 2019, Friday. For the class 10th of the academic year 2017-18, the board declared the exam result on May 29, Tuesday. Check CBSE Class 10 Result 2019: Where & How? As usual, the Central Board of Secondary Education (CBSE) will announce the date of result declaration after completing the evaluation process and setups to upload the scorecards. After that, there are many official procedures to release the results online to make it easy for the students to check without any difficulties. As a part of that, the board have few official websites and mobile applications to publish the results online. Choose any one of the platforms from to check the result; www.cbseresults.nic.in, www.cbse.nic.in, examresults.net, UMANG app, IVR (Interactive Voice Response), DigiLocker, and School websites. The direct result link will be available in this page once the result announced officially by the board. So, the students can check the results easily from this page. By clicking the link, it directs to the official page of CBSE 10th result. Step 1: Go to the board’s official website OR click the direct link in this page. Step 2: Click on the link which reads like ‘CBSE Class X Result 2018’ on the homepage. Step 3: Enter your roll number, school number, and centre number. The scorecard will be displayed on the screen. Please check all the details such roll number, name to confirm your mark sheet. Then check your marks given in the table. Take a print out or download as a soft copy on your system/mobile phone for further use. This is the first board exam for all the students under the Central Board of Secondary Education. Some students like to know the statistics of the past few years CBSE 10th result to check the reality against expectations. All school top rank students can’t be the top in the CBSE class 10 result. By checking the past few years of statistics, students can see the real and expect practically. In the 2018 result, the overall pass percentage was 86.70. Girls with a pass percentage of 88.67 and the boys with a pass percentage of 85.32. Prakhar Mittal from Gurugram, Rimzhim Agrawal from Bijnor, Nandini Garg from Shamli and Sreelakshmi G from Cochin, have scored 499 marks out of 500. 2017: the overall pass percentage was 90.95. The Pass percentage of boys was 93.4%, and girls with 92.5%. 2016: the overall pass percentage was 96.21. Boys 78.9 percentage Girls: 88.6 percentage. As mentioned above, the students need to carry their scorecard safely as it is an important document to study further higher studies. Now, there are many options to keep the original documents in the safest place. DigiLocker is one in the list to save all the original documents online to carry on mobile phones as a soft copy. Students can also download the scorecard from the official website and stored in their personal computers or other devices. Students should collect their original hard copy of mark sheet from their respective schools in a few weeks from the release date of results. After the release of the results, some students can’t be justified with their CBSE 10th result 2019 due to the low marks which are lesser than their expectation. They can apply for rechecking or re-evaluation to know the real marks. The board allows the students to register for the re-evaluation or rechecking on its official website after declaring the result. So, those students can apply for the same to check their papers or marks. Every year, some students facing disappointment due to low marks in the board examination. Even some students failed to get pass grades. The board offers another chance to write compartment exam in the same year with hin few months after the release of main CBSE 10th result. There is some procedure to appear for the CBSE 10th compartmental exam, the students are required to fill the application online and also to pay a certain amount as given. The admit card will be issued by the board to appear for the exam. The CBSE compartmental exam result will be declared within a couple of months.